PDR is constructing two buildings on this Largo, FL site. A three story, 72,000SF Class-A facility will accompany a 19,000SF single story mixed building. 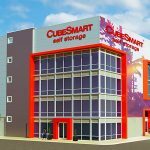 CubeSmart will manage the property.